One of our readers has forwarded on to us some correspondence he has recently had with Watford Borough Council (North London) about their motorcycle parking policy. Whilst we had so far assumed that the motorcycle parking policy in Westminster (one of the boroughs in Central London) was by far the most discriminatory and socially exclusive of all by offering motorcyclists only one method of payment on the (erroneous) assumption that all bikers own a mobile phone and/or a credit/debit card, you will most likely be shocked by the below correspondence between our reader and Watford Borough Council. “Whilst in Watford I used to call in on my friend for a couple of hours each week, but now rarely do so because I don’t want to incur a penalty charge through no fault of my own. I ride a motorcycle which presents several problems for the visitor who wishes to park in Shaftesbury Road and I don’t believe you have given adequate consideration to incorporating all road users in your parking scheme. 1. How do you suggest the Pay & Display parking ticket or the 185mm x 94mm Resident’s Visitor Voucher be attached to a motorcycle so as to ensure that it isn’t stolen for use in a car? What steps can I take to make certain that the voucher survives, for example, the torrential precipitations of October/November 2012? 2. Where should the voucher/ticket be displayed in order that the Parking Attendant actually sees it? Around the handlebars? Front forks? Across the petrol tank? Pillion saddle strap? Where? 3. Some months ago I was advised by one of your staff to stick the Resident’s Visitor Voucher to my bike using Sellotape but this is ineffectual in the rain. In December I nearly got written up for a parking violation simply because the sodden voucher, stuck on the side of the petrol tank with Sellotape, fell off. “It has always been this Council’s policy that all vehicles, including motorcycles, must pay and/or display the required voucher or ticket. It had always been understood the reasoning for this to be that many of the CPZ [Controlled Parking Zones] roads are already under pressure and there is simply a lack of road space to allow these vehicles to park on-street for free. 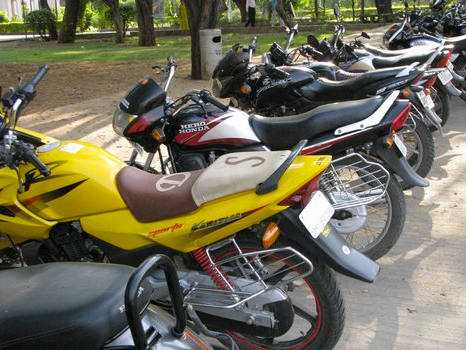 Depending upon how a motorcycle is parked it can take up the same space as a car. As a result, unfortunately no exceptions apply in the CPZ TRO [Traffic Regulation Orders] for motorcycles. I do understand the problem you are experiencing with displaying your visitor’s voucher/parking ticket however, as per the publicised cancellation policy document, which is on the Council website, it is not possible for the Council to advise motorists how they display tickets of vouchers. All motorcycles are different, i.e. some have windscreens and others do not. Ultimately, this remains the responsibility of the motorcycle owner. I am sorry that I cannot help you any further with the problems you are having in displaying your parking ticket/visitor’s voucher and trust the above helps to clarify the situation”. Right, so if we understand Watford Borough Council’s message correctly, you motorcyclists are a nuisance to us and we don’t want you around. It is entirely your problem if you have decided to own (and ride) a motorcycle and, therefore, you must face the consequences of your choice. We consider and treat motorcycles like cars so get on with it as we will not make any effort to help you and provide an adequate and practical solution to the issues you are facing with our universal parking policy. Oh well, thank God, not all borough councils across the United Kingdom and beyond are being so short-minded and discriminatory against bikers, who use a mode of transport that is a golden solution to road congestion, reducing air pollution and minimising space utilisation. This is the most ridiculous response I have ever seen from a public authority. It shows how little care and consideration they give to the public who have elected them. Good on you for publishing this story. Let’s see if MAG and BMF pick this up, as it is clearly their job to sort this out. This is discriminatory, and I thought our government was all about inclusion. Maybe a lawyer might like to take on a test case of discrimination against the council. Twice the council employee who responds uses the phrase “it has always been…” Pretty lame reason for continuing to be uselss isn’t it! Motorcycle & scooter parking should be free and free from time limits. Here in Melbourne Australia we won unlimitied bike parking on footpaths back in the 1980s. We are the only Australian state or territory to have this parking deal. Melbourne is car city. Public transport is inadequate. Traffic congestion is a serious problem. 4 million people in the state, more than 4 million cars. 70% of cars are single-occupant. 25% of cars are 4WDs (SUVs) that never go off the blacktop. Motorbikes & scooters are an important part of our transport system and this was documented in a federal government report on cities released in December 2012. Even so, the system is biased against riders. We are currently fighting to get the 64 recommendations of a state government report, also December 2012, taken seriously by our road authorities. Thank you Damien. Your link makes very interesting reading indeed. A golden opportunity for the Motorcycle Action Group to show their worth or will they stay true to form as the Motorcycle InAction Group ? Ça c’est une bonne occasion pour l’association MAG de présenter sa valeur, ou comme d’habitude, fera une course digne de lui – l’association qui fait rien. just read Phil’s note about the Motorcycle InAction Group – Phil the group is you and other bikers – if you aren’t seeing action and you’re not happy then take action yourself and get involved with MAG and organise it yourself? no point in slagging an organisation off that is doing its best to protect what we already have, its YOU that is the Motorcycle Action Group – that’s assuming you are member? No I’m not a member & I hope you’ll see why I let my membership lapse some years ago. I spent nearly 3 years demonstrating in Trafalgar Sq. with the NoToBikeParkingTax every Wednesday evening both summer & winter. I rode with NTBPT the North/South Circular & M25 twice, isolated Westminster Council’s Office & prevented staff getting into the building & was abused by Boris Johnson on his bike. I stood for hours with banners displayed outside the High Court in London when we took Westminster Council to Court twice. Some guys with the chairman took the Eurostar & rode to Brussels to present a petition to the EEC. Like others I gave generously of my time/money but MAG gave us neither encouragement nor support. Then in 2012 they shamefacedly wanted take over our circumvention of the M25 for their campaign on EEC legislation & expected us to do it without marshals ! MAG’s plan was downright dangerous. Contrast this with the FFMC’s role for example. One of their delegates actually flew over from France to address the massed bikers in London following the first M25 run. MAG’s absence was noteworthy. Through this website happily, our struggle was publicised but I’d be surprised if any mention of it appeared in MAG’s magazine. Is this the sort of action I should take ? When was it exactly, that you gave years of commitment in the rain, snow, cold, negotiating London’s traffic & then being hassled by Boris’s transport police whilst MAG’s membership were safe indoors. Think yourself lucky that through our efforts we stopped/delayed the pay by phone bike parking tax where you live, because, when we got involved the plans were already afoot to roll the scheme out across the country. Asked a traffic warden in ny street in central Watford about how to display my bike permit more securely than suggested above. His answer: Put it in your living room window and have a note displayed on the bike (eg, in a cheap licence disk holder) saying ‘Parking permit displayed at no. 1234 …. St’. I can see security implications … eg, determined trolls breaking in to nick the keys … but at least one Watford parking warden is more helpful than his employers at the council. « Westminster’s motorcycle parking charge: socially exclusive?